From funnel cakes to corn dogs: How does fair food fare? 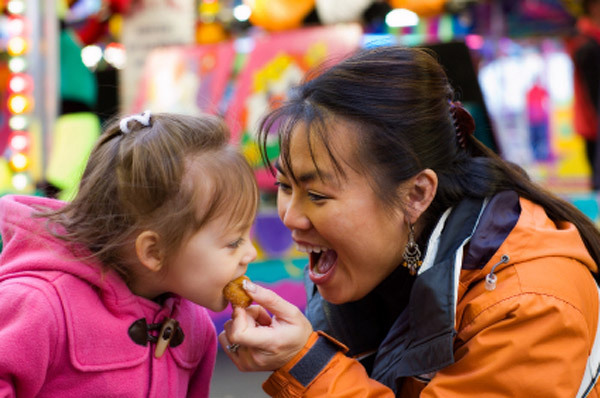 Going to the fair is a once-a-year experience for many, and eating the food there — from funnel cakes to cotton candy, corn dogs to curly fries — is at the top of the list of fun things to do. But into which food group do you think most of the food you can buy at the fair fits? That’s right… the treats and goodies you’ll find at the state fair or county fair are “discretionary calories” — or what we think of as “extras.” Those extra calories are typically limited to 100 to 300 calories per day for most of us (see the pyramid.gov site for details). A few hundred calories aren’t going to go far when you start looking at your food choices at the fair. But one way to enjoy extra goodies is to plan ahead and consume fewer calories a day or two before the festivities. Pass up the mega-size drinks. Instead of choosing a giant size calorie-laden soda, juice or fresh squeezed lemonade, opt for the smaller version instead. An even better option would be to bring along water, which is calorie-free, and then you can start your calorie balance sheet at zero. Share with others. Since there are so many tempting options, think about having a little bit of several different things to keep from feeling deprived. Cotton candy is an easy treat to share, though things on a stick and/or deep-fried don’t fit into this category as easily. Avoid grazing. When you “graze,” it’s hard to know how much you’ve eaten. As you walk around, you buy this-and-that to munch on, and it’s easy to lose track. Check out the food options as you’re walking, make your selections and then sit and eat. That way you’ll be more conscious of what’s gone into your mouth. Consider setting limits. A funnel cake is a deep-fried sugar-topped delicacy chock full of fat and calories. Let’s face it; the fat grams in this choice are way over any reasonable limit in a healthy diet. You may want to enjoy this treat without sharing, but it would be advisable to make good choices the rest of the day. On average, a 120-pound person burns about 80 calories an hour walking at 2 miles per hour; a 180-pound person burns around 120 calories an hour. The number of calories you burn walking depends on your own body weight and the distance you walk. Heavier weight people will burn more calories per mile and you’ll burn more calories the further you walk. If you can walk a mile in 15 minutes, you’ll likely burn about 100 calories… though while at the fair you’re unlikely to be walking at that pace. Here’s a list of how the calories in typical fair foods translate into the number of miles you would need to walk to burn off those calories. Even with the best intentions, some of you may feel that you’ve overindulged by the time you’re leaving the fair. If you’re looking for a back-up plan, consider that tomorrow is another day. Get yourself back on track with your food choices and get going on your exercise. >> Get some more healthy substitutes for your favorite summer foods! A transgression here or there for a special occasion will not undo an otherwise healthy lifestyle. Remember, it’s all about the choices that you make on an everyday basis that really matter the most.